Copperhead Salon has yet another win!!!! Chris Martin has placed a win in the 2010 KMS Session Stylist search. Out of thousands of entries there were three first place winners and Chris has placed 2nd in an honorable mention category among five other talented stylists. His photo will be published in KPSS Salon Magazine. Copperhead salon is proud to announce that Chris Martin and Jeffrey Marston have both won national acclaim for the "Sign Your Look" Goldwell competition. There were six categories and copperhead has filled two of the categories with their winning photos. Chris Martin won for VOLUME and Jeffrey Marston has won with his photo for the CURLY category. Congratulations to you both. Read more in the Orlando Sentinel fashion focus section online below. 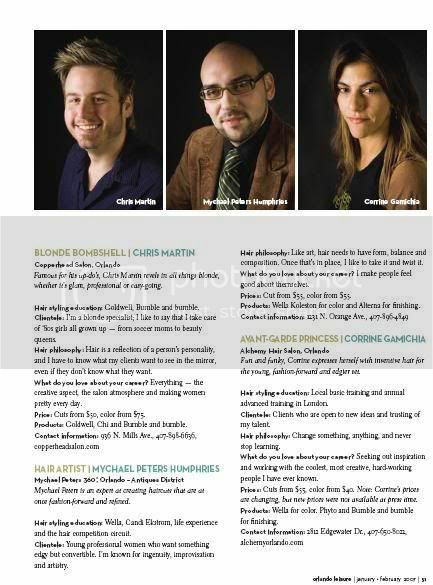 Congratulations to Chris Martin and Jeff Marsten of Copperhead Salon in Orlando. Both are winners in the "Sign Your Look" international photo contest sponsored by Goldwell, a hair-color company. Thousands of contestants entered the six categories. The winners of five of those six categories were all from Florida -- including Chris and Jeff. It is the first time two stylists from the same salon have been top-spot winners. Wow! Copperhead Salon is excited to announce their involvement in the widely publicized wedding event -A Match Made in Halo. You may view the wedding and the fabulous Copperhead stylings through the link to MTV News below. Congratulations to Desirai and John Henry, we had a great time. 'I love 'Halo'; I love her,' the groom says of his bride's idea (seriously!) for the theme wedding. They met playing "Halo" in 2004, and in January they'll get married by a guy wearing Master Chief armor. Desirai Labrada, 29, and John Henry, 26, are having a "Halo" wedding. For more on the happy couple's wedding plans, check out their Website and Multiplayer.MTV.com for updates as the big day approaches. How’s this for a record? For three years in a row, Chris Martin, owner of Copperhead Salon in Orlando, has been the hairstylist for the winner of the Miss Florida pageant. Which means he also is the haistylist who will prepare our new Miss Florida, Jaclyn Raulerson, for the Miss America pageant in January. Another of Chris’s clients, Ashley Ramsey, made the top 10 in this year’s pageant. His other Miss Florida winners were Sierra Minott in 2008 andRachael Todd in 2009. As a result of these successes, Copperhead Salon has been designated the official salon of the Miss Florida Pageant. There's one big difference between a pageant hairstyle and a regular hairstyle. With a pageant style, "You've got to think about where the crown is going to go," says Chris Martin, hairstylist to a former Miss America, the current Miss Florida and several other pageant queens and runners-up. "You do her hair in a way it can be mushed down for the crown, but still look great. And you do a little teasing on top to anchor the pins," says Martin. Other than that, a pageant contestant wants what every woman wants for her hair: a flattering, shiny, versatile style -- and no frizz. "Pageant hair was never my focus. I just fell into it," says Martin, 38, owner of Copperhead Salon in Orlando. Several years ago, the directors of Orlando's Miss City Beautiful pageant, who were longtime clients of Martin's, persuaded him to offer a hair makeover as a prize for the pageant winner. In 2003, the winner was Ericka Dunlap, who went on to win the Miss Florida title, then the Miss America crown. And we’re just so busy. Busy, busy. Busy scissors, oh-oh, oh-oh. “You’re a hairdresser on fire!” Taylor snips and swishes as we gather in anticipation of what might just be the best, most ridiculous night ever. “No, you are!” I twist and pout. Morrissey’s coif is holding asexual sonic court in my gracious drawing room as varying shades of my nearest and dearest unsolved follicular homicides pile their suedeheads into my pre-party fray, and I could almost swear that I’m not old and tired, and that washing this Vicodin down with that vodka isn’t self-medicating, but an actual good time. Choruses of “We’ve still got it,” (or worse, “She’s got it,” in droll Bananarama post-AIDS tones) while not clearly sung, are presently being applied generously, rinsed and repeated. “We should probably go,” reason speaks through its grinding teeth from up on high. Yes, we should. In the low-culture blender tonight are two split ends of disparate means: a hair salon grand opening and a lesbian auction benefit mess, both on the same ViMi block, so reason probably isn’t what I’m hearing at all. If one were to take the implications of these two situations, boil them down into a toxic liquid and huff the noxious fish-n-Ferragamo fumes, then one would certainly be eyeing an imminent expiration date and a rainbow flag–draped coffin. Because sometimes a hot-glued weave foil-wrapped in globs of bleach isn’t enough humility to elicit the required “I’m still 30, dammit!” from your more superficial side, ViMi beauty newbie Copperhead Salon – itself something of a mutiny endpoint for the old Wave scissor set – occasionally raises the bar (and the brow) with little pricks of agelessness. Local Oriental medicine/aging expert Dr. Anthony Beck, of SaJune Medical Center and Spa, pops in now and again with his magic juice for a foray into wrinkle reduction. Think of it as a Tupperware party with less regret.